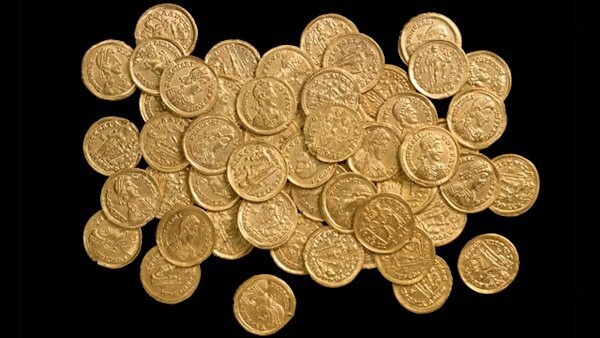 Armed with a basic metal detector, a first-time treasure hunter in Britain reportedly has uncovered a trove of Roman-era gold coins that experts believe represents one of the largest such finds in England’s history. The cache of coins – Roman solidi dating back to the 4 th century – is estimated to be worth £100,000, or about $160,000 in U.S. dollars. The shop’s owners, David Sewell and Mark Becher, were stunned. They told the novice treasure hunter to notify authorities of his discovery, the paper added. When he obtained the required permits, Sewell, Becher and others returned with the man to the discovery site. The solidus coin dates to the closing years of the fourth century. They typically were buried as a sacrifice to gods when the owner was going on a journey or in times of war, said David Thorold, a curator at the St. Albans’ Verulamium Museum, the Associated Press reported. The local government said the coins were found on private land. Experts at the British Museum will examine the haul to determine its final value. Depending on their opinion, the amateur treasure hunter could get at least a share of the proceeds, reports said.